Did any of you brave the "Black Friday" crowds at the new Winco stores in Orem and Ogden today? One of our readers, Shelley, reported that in Ogden, she waited in line for 40 minutes for a cart and at least 30 minutes to check out. Was it worth it? You bet!! She also discovered something I didn't - while wandering down the drinks aisle, she found the Capri Sun Sunrise drinks that went with the manufacturer coupon (the ones in the main area were not the Sunrise variety so I assumed they were not included) - and, yes, they could be used with the in-ad coupon, making them free!!! Way to go, Shelley!! After tax, my total was $31.65. 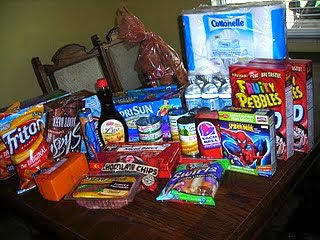 I bought 28 items and saved $18.48 with my coupons! You can see there were a few "extras" I bought, too, but the price was right! How was your experience at Winco?